This report presents a careful summary and an up-to-date explanation of research — from the biological, psychological, and social sciences — related to sexual orientation and gender identity. It is offered in the hope that such an exposition can contribute to our capacity as physicians, scientists, and citizens to address health issues faced by LGBT populations within our society. 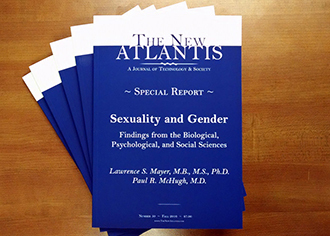 Lawrence S. Mayer and Paul R. McHugh, "Executive Summary," Sexuality and Gender: Findings from the Biological, Psychological, and Social Sciences, The New Atlantis, Number 50, Fall 2016, pp. 7-9.